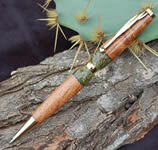 The Texas Penwright makes presentation-quality pens and journals from "pieces" of the Lone Star State: mesquite, liveoak, prickly pear cactus and white-tail deer antler harvested from Texas ranches. 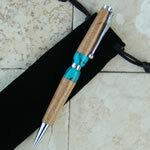 These Taking Texas with Me™ pens are really nice holiday, graduation or birthday gifts. (Is my family listening out there?) and come with "Certificates of Authenticity". The Cowboy Journals feature natural cowhides, some of which came through the stock yards in Fort Worth. 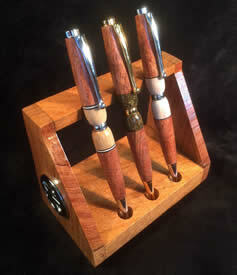 Buy any of the Taking Texas with Me™ gifts from the maker, The Texas Penwright. And tell 'em, Truly Texan sent you!